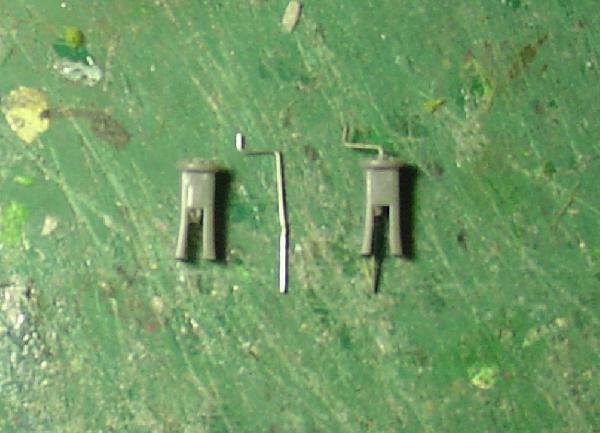 Following yesterday's work on the points, I added the point levers. As there were only five in stock, I had to make another two, made from widgets supplied by a friend. Made a start on the back-scene, with Great Sutton's rural cut-outs removed from the MDF back-board. As they'd been attached with Pritt this turned out to be an easy job with a damp sponge and a scraper. The two ends were cannibalised from spare bits and pieces, and are now all primed with sky blue. Another coat tomorrow should make them ready to screw to the baseboard, then the control panel can be built on the rear face of the end next to the fiddle yard, which will be a major step forward. I took some time off yesterday to visit a nearby club's exhibition, and resisted the chance to start a project in American S-scale narrow gauge. The chance of a Rivarossi "Reliance Rock" for a tenner was extremely tempting, though. I've always though that this model, which seems rather large for HO (at least compared with the Alco 0-6-0ST), would be a very suitable candidate for a little gentle up-scaling. At last, the back-scene is starting to take shape. It was a bit of a search as I wanted at least one street view taken from the top of a hill, so as to give the impression that the station is on the edge of the High Town area in Bridgnorth. Plus it had to look like a 150 year old scene. So here is the view from the station yard, which has been stitched together from four different images, with only the building and trees on the extreme left, hidden behind the station's chimney, actually being Bridgnorth. Thank goodness for modeller's license! 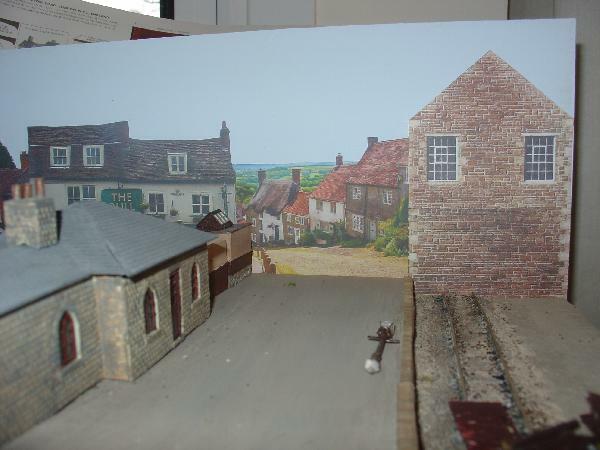 Still a little work to do - barge-boards and a suggestion of the roof on the stone warehouse, and some chimneys for the pub, plus some fencing and a gate to mark the edge of railway propertry. Work on the back-scene has been progressing, but more slowly than I hoped. I had a reasonable collection of possible scenes to use, but no real idea as to how to blend them. Add to that a fast emptying ink cartridge.......Now topped up, and on course to complete tomorrow, with luck. A total of twelve images in a run of just under six feet - plus some low relief buildings to hide some of the worst transitions. Then with the back-scene boards in place I can move on to making the control panel and terminating the loom of raw wiring that is currently erupting from a hole in the baseboard, hidden by the engine shed. 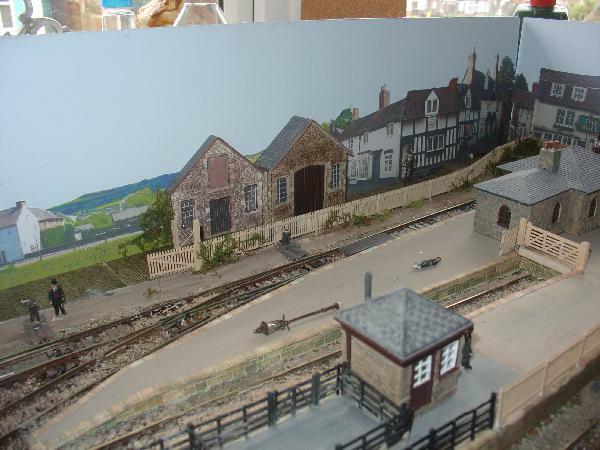 The corner of "Bridgnorth" surrounding the station is almost complete. The cottages beyond the station are part of the real Bridgnorth, but I've borrowed them to be part of the area round my version of Salop Street. There will be some trees behind the angled cottages to help the transition to the countryside that will start to the left of the two half-relief stone warehouses. The deeper one is due to have about half of its depth removed, so that there is room for cart traffic to reach the doorway, while a boundary fence beyond the tracks should help to hide the rather sudden transition from 3D to 2D. During the afternoon almost all the rest of the scene was put together. There is some bad continuity in this shot as the road comes to an abrupt halt. The goods shed (represented by its roof, balanced on a paint pot) will mask this and, I hope make viewers think the road bends away and emerges behind the cottages next to the large warehouse. 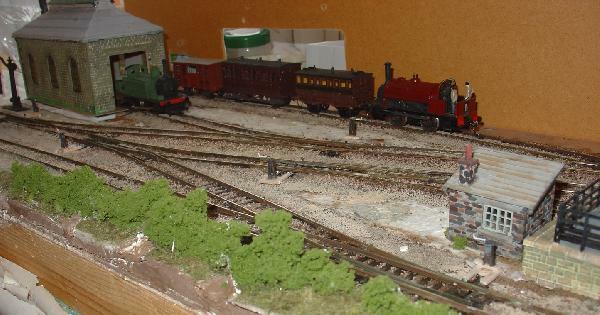 Decided yesterday to re-use the goods shed from the last layout, instead of building another. It just needs a bit of work to the roof. 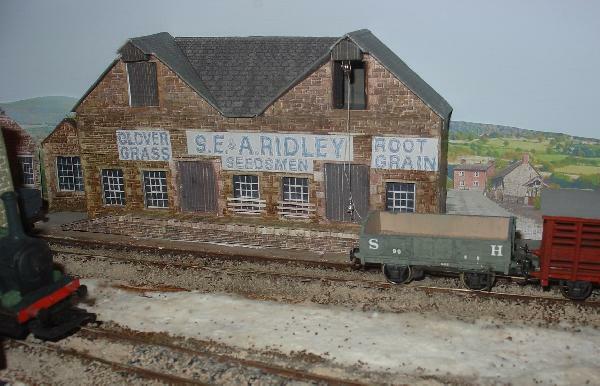 The large warehouse now belongs to a real feed-and-seed firm from Bridgnorth, established in 1616, so certainly able to have a railway store in the 1860s. I'll have to have a think about that gable end hanging in the sky. It would look better, perhaps, as a single storey building, otherwise I could turn the roof-line 90 degrees and add a couple of gable ends to the front wall. It'll do for now, until I get more of the layout completed. 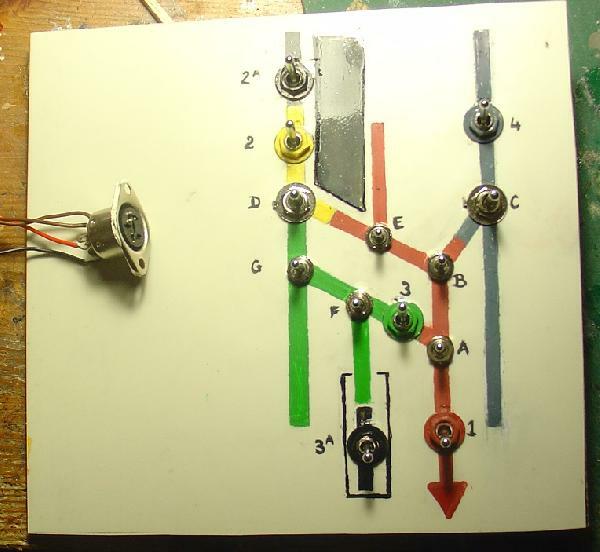 Next job is to attach the back-scene to the baseboard and make a start on the control panel. Had a little spare time this afternoon and re-designed the Ridley warehouse. It is now a single storey with two gable ends facing the track. With a connecting roof at right angles between the gables, the height is just enough to cover the hole in the back-board that used to house the control panel for Great Sutton (being a cheapskate, I just turned the board round and re-used it). The gables will have an upper doorway with a hoist. My problem was to copy extra gables - the originals appearing in another building - and match the colour to the original lower storey. After many attempts I've just now managed it. Tomorrow's work will be to lay the new copies over the present ones that are not quite right, add the roof, and then take new photos. Nearly there with the warehouse re-build; much better than before, I think. In the end I matched in the join between the ground floor and the gables with water colours. Wish I hadn't wasted the time and ink on the computer! I remembered that there were some spare boat fenders in stock, so the smallest has become the counterweight on the hook of the hoist, with a small press-stud as the head pulley. I'll try and arrange a cameo of a couple of guys hooking a sack onto the line and another waiting to receive it, at the top. The back-scenes have now been screwed in place, during which a little damage occurred which has been repainted. A good deal of fencing has been installed - a mixture of dark brown and unpainted white plastic - so I'll wait until it all matches before any more pictures. The old dark brown looked too "heavy", now that there are some long runs of palings, some in the foreground, so I'm going for a buff colour, which is the second shade used on the company's wooden buildings. The platform lamp posts can stay dark brown. 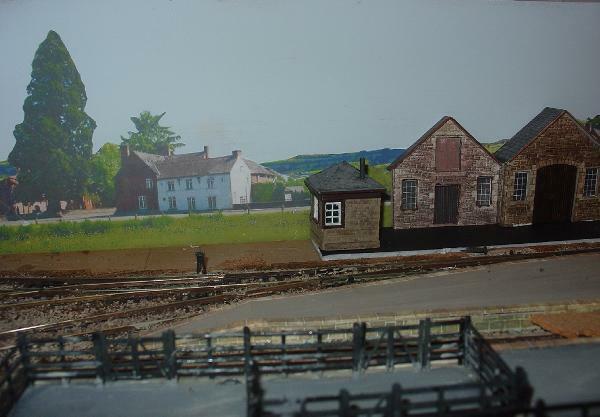 Another change in the overall composition of the scene has been to move what was to have been the railway policeman's hut to the cattle pen area, where it becomes the goods checker's office. With the roadway added beyond the rear tracks, there was no longer room for the hut in its original position. 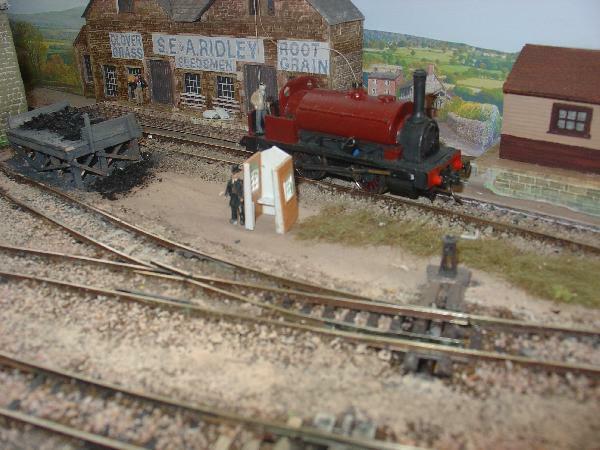 The bobby will have to do with a little sentry-box, like those on the broad gauge GWR in early days. The past few days has been mostly spent on the wiring connections below the control panel, but I've also made the panel itself. The plug, which carries power to and from the hand-held controller, will go into the white space, behind which are the choc-strip connectors from the wiring loom, but I'll need to cut out a bit at the bottom to leave the terminals exposed where the power leads from the transformer will plug in. The overhead light is reflecting on the panel's surface. I put a thin sheet of styrene onto some MDF, instead of painting the top of the panel white - couldn't find enough white paint! Panel wiring is nearly complete, and quite a spaghetti bowl as the switches are closer together than usual. Meanwhile I've started on some of the scenic details. 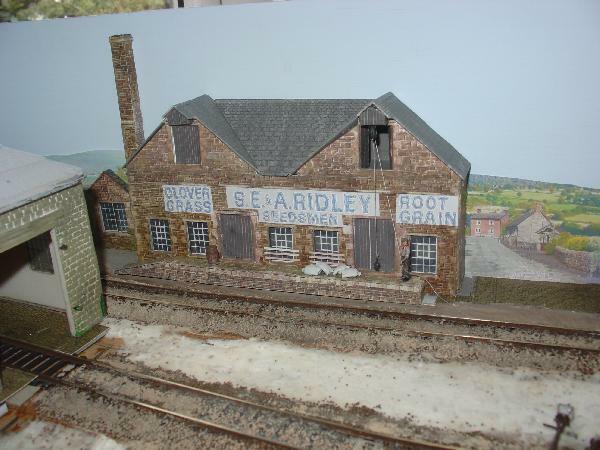 The Ridley building now has a boiler-house, as well as the start of the loading crew. I have a kneeling figure on Shellsea who could well become his own grandfather and appear here, while a porter and milk churn (with churn removed) may be in the correct pose for the workman on the upper floor of the building. The town has also started to come alive - here is a shot of the try-out for lamp-posts etc. I must go down to the shed, where there is some L-shaped moulding that will take care of the split corner in the back-scene. My period figures are nearly all males, and as this is a town I think there should be more females in view. There is nothing useful in stock, all the spare figures being HO, so I may have to model some myself, using a wire armature and filler. That may not be until after the layout's debut next month, as time is slipping by rather too fast for comfort. 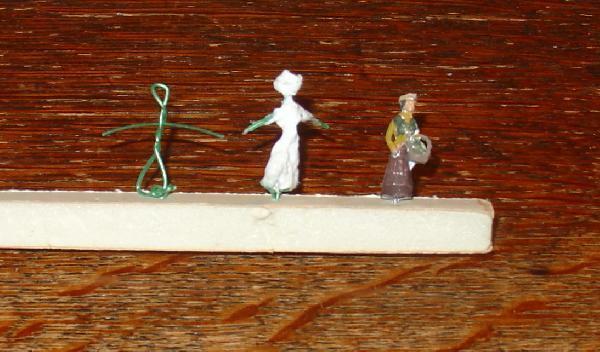 On the left is a basic armature of the thinnest garden wire, which is nice and flexible. Onto this I painted some white glue and then started to wind long, thin shreds of toilet tissue round the figure, using more glue brushed on to hold the paper in place. After building up the lower body and skirt I started to wind the paper around the upper body and onto one arm at a time. The head was a tiny screwed up ball of paper, attached the same way to the loop at the top of the armature. The suggestion of a hat brim came up by accident. I'm leaving it to dry overnight, but I think there will be enough movement in the morning to pose the arms, before continuing to lay more paper on. The figure on the right is a commercial model, which I'm loosely copying and using to check my figures are the correct size. Did a little work on the second figure, which looks as if it will be a slightly older person. Also managed to push the bottom of the skirt of the first figure up a bit to make her less tall. However the main job today was to finish the wiring connections, which I'm glad to say is done. The layout's first show is three weeks away, so I need to get on - despite there being rather too many other distractions and appointments in the diary. The small huts and structures are coming along well, but there still remains the timber yard sheds to hide the exit to the fiddle yard.......and the fiddle yard itself, which has a baseboard but no track yet. Work on creating new figures is going to have to wait. I'll try and take more pictures at the week-end. Some work in progress. 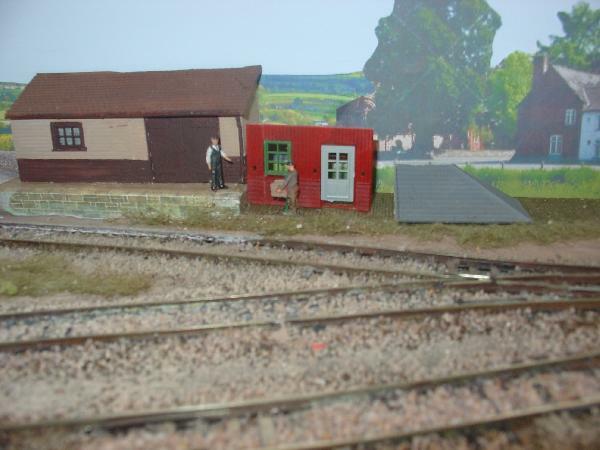 The goods shed is getting an office, and the policeman's shelter is taking shape. In the background is the new coaling stage.